The 9/11 attacks imprinted themselves on Americans’ psyches in a way few other events in living memory have. In an August 2011 Pew Research survey, 97% of Americans who were at least eight years old when the attacks happened said they remembered exactly where they were or what they were doing when they heard the news. The only event with that kind of recall was President Kennedy’s assassination in 1963 (95%). Other notable events, from the 1969 moon landing to Osama bin Laden’s killing, ranked well behind. 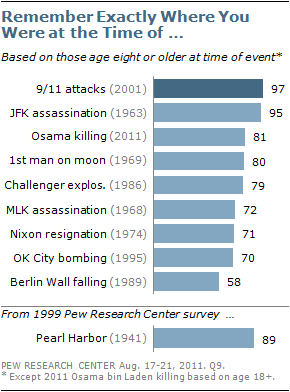 In a December 2009 poll, 53% of Americans picked the 9/11 attacks as the most important event of the previous decade. Beyond the human toll — nearly 3,000 people died aboard the four hijacked airplanes, at the World Trade Center and at the Pentagon — the attacks struck deeply at Americans’ sense of security. In the 2011 poll, 75% of people reported that they’d been emotionally affected “a great deal” by 9/11, compared with 67% a year after the attacks; 61% said life in America had changed “in a major way” since the attacks, up from half who said that in 2002. One thing that’s changed is Americans’ sense of whether another 9/11-style terror attack is possible. Almost a year after 9/11, 34% of people said terrorists had less ability to launch another major attack on the United States than before 9/11, compared with 22% who said they had greater ability and 39% who said it was about the same. As we continued asking that question over the years, those percentages have shifted up and down, but the trend has been toward greater concern: In November 2013, the most recent time we asked this question, 34% said terrorists’ ability to launch a major attack was now greater than it had been prior to 9/11, compared with 29% who said less and 36% who said it was about the same. About a fifth of Americans cite 9/11 response as event that made them most proud of U.S.